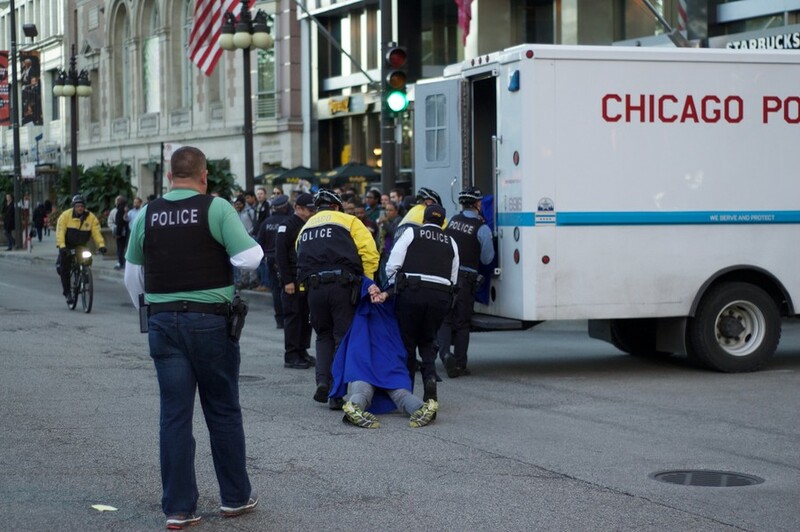 Chicago police carry a limp protestor in a cap and gown into a police van. Update (9:48 p.m.): At least one of the arrested UChicago students – Johnathan Guy – has been released. 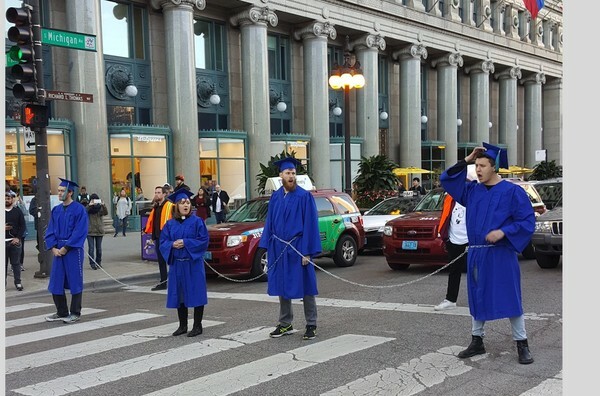 Two University of Chicago students were arrested at around 5 p.m. for blocking traffic on Michigan Avenue at a protest for free college education in Illinois. A Chicago Police officer cuts a chain linking protesters. 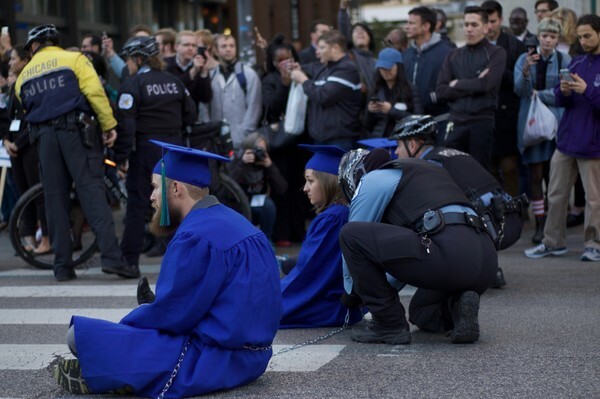 Fourth-year Johnathan Guy and third-year Jessica Law were arrested in front of the Art Institute of Chicago. Wearing caps and gowns, Guy and Law chained themselves together with two other protesters. Another group of four protesters were also arrested. Protestors called on Kenneth Griffin to support free college education. 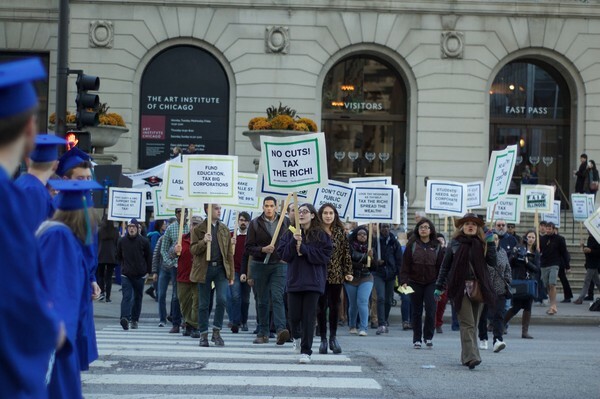 The protesters were demonstrating to encourage Art Institute trustee and hedge fund manager Kenneth Griffin to support free higher education at public colleges and universities. Griffin is a major donor to Republican Governor Bruce Rauner. 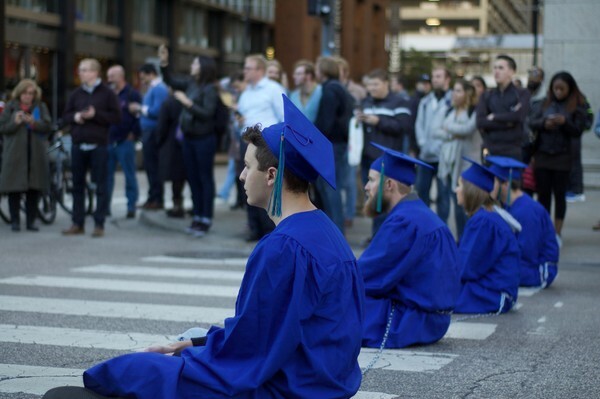 Four protesters wearing caps and gowns chained themselves together to block Michigan Avenue on Monday. Three UChicago students were arrested at a demonstration targeted at Griffin last year. Both protests were part of the "Moral Mondays" series organized by Fair Economy Illinois. Four protestors block traffic on Michigan Avenue. Chicago Police News Affairs was not immediately available for comment. Reporting contributed by Alex Ward.